Sharp Conjures Up World's First 3D Camera For Phones—and the Nintendo 3DS? Designed for mobile devices such as phones, digital cameras or even netbooks, Sharp's 3D camera module will start mass production this year—meaning within the next couple of years we could be shooting image-popping HD 3D video. While Sharp isn't known for phones in our parts, if you walk into any store in Japan you'll be bowled over by dozens of their candy-colored models. These 3D cameras could first be trialled in Japan, but if successful be licensed out to other manufacturers to tantalize us with eye-popping possibilities. The obvious question, of course, is why you'd want a 3D camera on your phone in the first place? Fujifilm's FinePix Real 3D W1 digital camera hasn't exactly taken off (do you know anyone who's even considered buying one, let alone laid down 600 big ones for it? ), so why should a 3D video camera on a phone? Again, it seems like one of those situations where British explorer George Mallory's reply when asked why he wanted to climb Mount Everest ("because it's there") seems suitable. Or, perhaps more people want to make their very own Avatars than I originally thought. While Sharp's press release on the subject mentioned simply "digital cameras, mobile phones, and smartphones," we must remember that Nintendo's 3DS is rumored to be using Sharp's glasses-less parallax barrier technology in its displays. With the latest crop of DSis having dual cameras it's not entirely unfathomable that these 3D camera modules could be first seen in a certain portable gaming console—due for release sometime before April 2011. 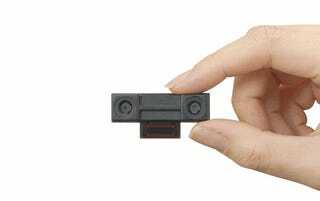 Osaka, May 12, 2010 - (JCN Newswire) - Sharp Corporation has developed a 3D camera module for mobile devices capable of capturing high-definition (720p)(1) 3D video images, an industry first. (2) Sharp will start shipping samples in July. Mass production of these modules will begin within 2010. In the future, Sharp will be opening up new 3D markets based on 3D display technologies, including small/medium-size and large-size 3D LCDs, as well as on 3D input device technologies such as 3D camera module. (1) 720 effective scanning lines (progressive scanning system). Resolution: 1280 H x 720 V pixels. (2) As of May 12, 2010, for camera modules used in mobile devices.